You cannot enter the Jaipur Literature Festival without registering for the same. However, the registration procedure is simple. You can either register in person or go to the Festival website (recommended to avoid long queues). Registration can be made for General Entry or as a Delegate. General Entry offer free entry to all sessions at the Festival. Entry as a Delegate too offer full entry to the Festival and includes lunch and dinner at the unlimited buffet food and alcohol and entry to music events. It will cost $60/2,500 rupees per day. A special rate of $240/10,000 rupees is available to those who plan to attend all the five days of the Festival. If you want to meet and socialize with authors and other important people, make you entry as a delegate. You will find the famous personalities at the lunches and dinners. But, if you are simply interested in attending the literary sessions, General Entry is good enough. Tickets for night music events are given out to the non- delegates. The cost is 200 rupees per person which can be bought online or from the venue. 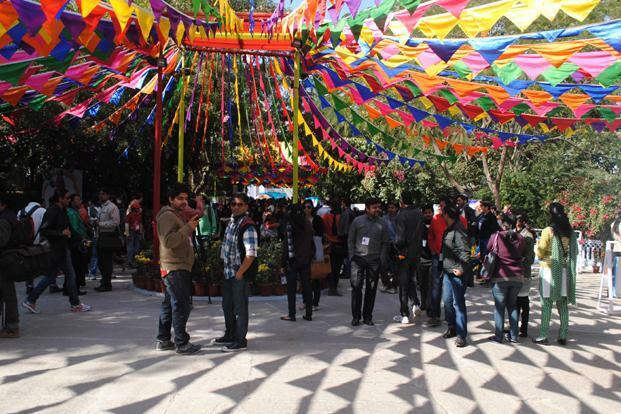 The sessions at the Jaipur Literature Festival 2014, will be spread out over a number of venues. The largest of all being the Front Lawns at the Diggi Palace. If you are lucky enough, you can also get a complimentary event program at the Festival. All the details are provided in the Festival’s official website. You may choose to attend the sessions in two ways. One is to plan the sessions you want to attend in advance and the other is to wander from session to session depending on your interests. The venues are always expected to be extremely crowded. If you want to save yourself a seat, try to arrive 30 minutes early. What to Wear for the Jaipur Literature Festival? There are not dress codes given. So, you can be all casual. Days in Jaipur at that time of the year remains warm and sunny but as night approaches, it will start to chill. Therefore, do not forget to carry jackets and scarves along.